Windows 7 operating system has lot of pre-installed (default) games. List of Games include: Chess Titans, FreeCell, Hearts, Internet Checkers, Internet Spades, Minesweeper, Purble Place, Solitaire and more. You can easily access all these games on Windows7 PC: Click Start and type games in search bar to open Games Explorer window. If you have kids using Windows 7 PC and spending too much time on these games, you can easily remove these games from your Windows 7 computer. 1. Goto Start and click Control Panel button. 2. In the Control Panel window, click Programs and Features option. 3. Then click “Turn Windows features on or off” on the left side of ‘Programs and Features’ window. You should see ‘Windows Features’ dialog box. 4. Click to uncheck (no tick) next to Games option at the top and click OK button to remove all games. To selectively remove specific games, click + sign next to Games option and then click to uncheck specific game for the removal. 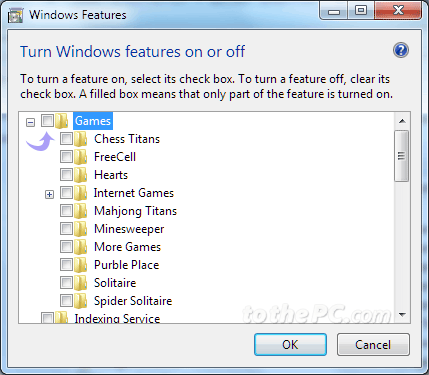 You can easily install and restore back removed games by checking (with tick) games option. I see no real reason to remove those games — they occupy very little space on a disk, and are good entertainment in a free minute.